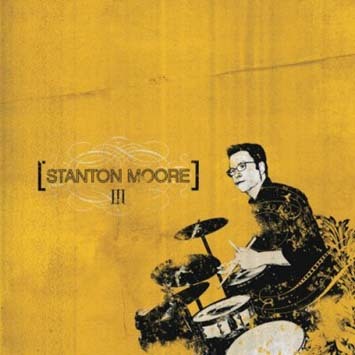 Drummer Stanton Moore, a founding member of the immensely popular "steamroller funk" band Galactic, makes his Telarc debut with the September 26, 2006, release of the aptly titled III, his third solo recording to date. Born and raised in New Orleans, Moore is very much a product of geography, culture and creative colleagues. He grew up in a thriving music scene that included Professor Longhair, Doctor John, the Meters and countless other Big Easy mainstays. He hooked up with Galactic co-founders Robert Mercurio and Jeff Raines in the early '90s, but also launched a solo career toward the end of the decade with the release of All Kooked Out!Flyin' the Koop in 2002. His diverse resume also includes an ongoing alliance with eight-string guitar virtuoso Charlie Hunter (T.J. Kirk), saxophonist Skerik (Les Claypool, Roger Waters) and percussionist Mike Dillon (Les Claypool, Ani DiFranco), all of whom make up an avant-funk ensemble known as Garage a Trois, whose second disc, Outre Mer was released on Telarc in 2005. More recently, Moore has been involved in a myriad of projects, including appearances on Grammy nominee Corrosion of Conformity's In the Arms of God ("Stanton Moore earns his Bonham stripes on this one," according to Rolling Stone), Irma Thomas' After the Rain and Robert Walter's Super Heavy Organ. Moore also released a highly acclaimed and award winning educational series covering his approach to New Orleans drumming. The project, Take It to the Street, includes two DVDs and an instructional book - all of which feature The Dirty Dozen, George Porter and Ivan Neville. Stanton continues to tour and perform with a who's-who list of musicians and projects, including John Scofield, John Medeski, George Porter and Leo Noccentelli (the Meters), Bonerama, the New Orleans Klezmer Allstars and Anders Osborne to name a few. "When Stanton gets behind his kit with Galactic, or with one of his many side projects such as Garage A Trois or Moore & More, there's no doubt who it is," proclaims Modern Drummer. "Call his sound infectious. Call it part jazz-meets-Bonham. Call it nouveau second-line. No matter. Whether he's boppin' behind an 18-inch champagne-sparkle jazz kick or battle-worn old 26-inch, Stanton is serving up new-style funk." This highly recognizable - and widely recognized - groove returns on III, Moore's third solo recording and his Telarc debut. In addition to his "infectious, jazz-meets-Bonham, nouveau second-line" sound, III features Robert Walter (Greyboy Allstars, The Head Hunters) on organ and Will Bernard (T.J. Kirk, Doctor Lonnie Smith) on guitar, along with a few special guests: Skerik and trombonist Mark Mullins (Galactic, Bonerama, Harry Connick, Jr., Better Than Ezra). Moore recorded III at the legendary Preservation Hall in New Orleans. "I wanted to do something in the hall because of the sound in the room and the amazing vibe there," he says. "After Katrina, they weren't having music and were waiting to reopen, so I saw that as an awesome and rare opportunity to spend a few days in there with a remote recording setup and make a record." The ten-song set opens with the earnest rock-steady beat of "Poison Pushy," augmented by Bernard's thick guitar chord riffs and infectious solo lines and Walter's sneaky organ groove. The followup track, "Licorice," is a bit more heavy, with a swampy mix of guitar, organ and horns riding atop Moore's deep groove. The horn section steps to the forefront for some intricate melodic work on the grinding "Chilcock," while "Weak Sauce" takes a decidedly more funky turn and showcases Bernard's retro-flavored guitar work. Moore sets up a New Orleans nouveau second-line groove on the sparse but compelling "Maple Plank," a track that allows him plenty of room by employing the guitar, organ and other instrumentation only sparingly. In the final stretch, Moore pays a solemn tribute to his beleaguered hometown with a three-song suite. It begins with beautiful rendition of South African pianist/composer Abdullah Ibrahim's "Water from an Ancient Well," followed by a dark and ominous rendition of Led Zeppelin's "When the Levee Breaks," and closes with the gentle spiritual, "I Shall Not Be Moved," a track that suggests perseverance and resolve. Indeed, Moore is a survivor - literally and artistically. Despite some of his own personal setbacks in the aftermath of Katrina, he continues to channel the muse and explore the remote places where jazz, funk, soul and various other musical strains merge. III is, among other things, a survivor's tale - a recording that ignores adversity and pursues the creative ideal.